A new update for Darkstalkers Resurrection arrives on Friday, bringing with it online fight requests and more. 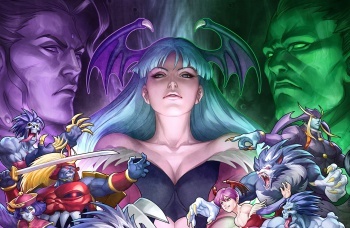 Come April 12, Capcom will release a patch for the phenomenal Darkstalkers Resurrection. Included in this patch will be a number of the typical bug fixes you always see with these updates, and one major new gameplay feature: Fight requests. Those of you who've spent time with any incarnation of Street Fighter IV should be familiar with this concept. Once the fight request option is toggled on, while playing any of the game's singleplayer modes (Arcade, Training, etcetera) other people playing the game online will be able to send you requests that effectively mimic the experience of playing a fighter in an arcade and having someone walk up and drop a few credits into the cabinet. The screen immediately flashes a "Here Comes A New Challenger" warning, then whatever you were doing is shunted to the side in favor of the new online battle. In Street Fighter IV this feature went a long way toward making the experience feel more authentic, while also ensuring that players never had to stare at indefinite lobby screens when attempting to find an online match. Instead, you just set the fight request option to reflect your preferred type of battle, then go back to enjoying the game's singleplayer components until someone opts to challenge you. As for the rest of the update, as I mentioned above, it's almost entirely bug fixes. There's a pretty extensive list of what's to be changed on True Achievements, so feel free to have a look there to see what'll be altered. As with all updates of this sort, this patch will be free of charge, and will automatically be downloaded and applied the first time you fire up Darkstalkers Resurrection after the update's launch.